Hello friends at present time there are billions of users who have to use WhatsApp in his Smartphone, pc, laptop or notebook. With the help of WhatsApp messenger you will be able to send or receive audio, video, text message, any images to other person. 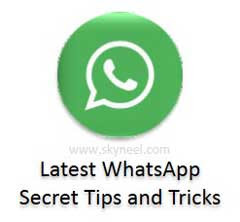 But there are lot of tips and trick which don’t know most of the users from which you will be able to do more on your WhatsApp like you can hide your last seen for other person, change your registered mobile number, turn on voice calling feature, and store your important chat history on the Google drive and many more. Step 1: Launch your WhatsApp on your android Smartphone, iPhone, BlackBerry or your computer. Step 2: Click on the three dotted lines which is placed on the top right corner of your WhatsApp messaging window. Step 3: Tap on the Settings option > Tap on the Account option > In the Account settings window you will get lot of option, tap on the Privacy option. By default this option is already set in your last seen window. If you want to show your last seen will be checked by all of other persons then you have to select this option. If you want that you last seen are shown only by those persons who are already added in your contact list then you have to select this option. If you want to hide your last seen for everyone then select this option. I would like to recommend choosing this option if you want to hide your last for all. There are lots of persons who are using WhatsApp messaging app on his Smartphone or computer from a long time but if they want to change his number which is already active in your WhatsApp due to different reasons in that situation if you are not familiar with this trick then you will be frustrated and ask other person for this solution. But now, today i told you a simple trick from which you will be able to easily change your number on WhatsApp, have a look. Step 3: Tap on the Settings option > Tap on the Account option > In the Account settings window you will get lot of option, tap on the Change number option. Step 4: Tap on the Next option > Now, it will ask you to fill your old and new phone number with your country code then tap on the done option to save all changes. Finally your number will be changed. Step 1: You can easily download WhatsApp voice calling latest version 2.12.14 from the WhatsApp Company’s website or you can also download 2.11.561 version from the Google Play store. Step 2: After download and installed WhatsApp voice calling latest version on your Smartphone talk to other person who already enable this feature on his Smartphone. After installing this feature on your Android, iOS or Windows Smartphone now, you will get three buttons on your WhatsApp window for Chats, Contacts and Calls. You also able to check last seen running message on your WhatsApp window. Step 3: If you want to call someone using the WhatsApp then first select the name of person from which you want to talk using WhatsApp voice calling feature then point out phone icon which is placed on the top of your WhatsApp window. But remember one thing that at a time you will be able to talk with single person with the help of this feature. If you want to download latest version of WhatsApp for voice calling feature then you must go on Google play store or WhatsApp official website and download. Step 1: Go to the official website of WhatsApp or Google play store and download latest version of WhatsApp on your Smartphone. Step 2: Now install latest version of WhatsApp on your Smartphone. Step 3: Now, open Settings option > Select Chat Settings option > Chat Backup > Select “take a backup to Google Drive” option > Type your Gmail account in which you want to save your chat conversation. I hope you like this article, please read carefully this article then you have to follow these given steps. These tips and trick will be helpful for you to overcome different kind of situation from which you will be frustrated. Give your important suggestion in the comment box regarding this article. Thanks.